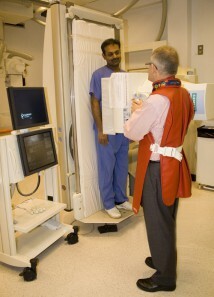 Fluoroscopy is a special type of x-ray that enables a Radiologist to examine different parts of your body in real time. The examination is usually performed in a specialist suite and images of your internal organs are displayed on a monitor in the room, similar to a television screen. Many examinations use x-ray contrast dye to better see the organs in your body. Fluoroscopy can be useful to diagnose disorders of the digestive and urinary systems. It is also occasionally used when investigating problems associated with the salivary glands and some joint conditions. Barium swallow: an examination where contrast is swallowed to show the oesophagus (gullet). This is useful to investigate swallowing problems. Barium meal: an examination where fizzy powder is swallowed to distend the stomach before drinking the contrast. This is useful to investigate problems involving the stomach and duodenum. Small bowel meal: an examination where contrast is swallowed to show the small intestine. Barium enema: an examination to show the large intestine. Barium is run into the large bowel through a tube that is placed in the back passage. Air is then blown in through the tube to distend the bowel, enabling it to be seen well on the X-ray images. This is mainly used to detect inflammatory conditions of the large bowel, such as diverticulitis, or bowel cancer. Sialogram: This is a contrast examination of a salivary gland; these glands are found in the side of the cheek and under the tongue. A tiny cannula is passed into the opening of the duct from the gland in the side or floor of the mouth. A small amount of contrast medium is injected to outline the duct system of the gland on X-rays. Micturating cystogram: a contrast examination of the bladder and urethra (tube exiting the bladder). A small catheter tube is inserted into the bladder to allow the Radiologist to run the contrast medium in during the examination. The tube will then be removed. Several X-ray images are taken before and during bladder emptying. Arthrogram: an examination where contrast medium is injected into a joint to obtain images of the joint on X-rays, CT or MRI scanning.